Peanut Butter Health Benefits and Uses - Why do We Love It? The numerous peanut butter health benefits of this tasty snack include protection against certain diseases including Alzheimer’s and gallstones, and high levels of antioxidants, potassium, and other vitamins and minerals that are important to incorporate into what you’re consuming daily. Peanut butter is a product that appears on the U.S. market in 1903. Namely the United States is the largest producer and exporter of peanuts and peanut products in the world. After them are China and Argentina. Peanut butter is one of the favorite foods of the Americans, and everybody else seems to be afraid from it. If we add the fear of allergies, the concerns that it is very caloric and the specific taste that it has, outside America rarely who reaches for the jar with peanut butter. 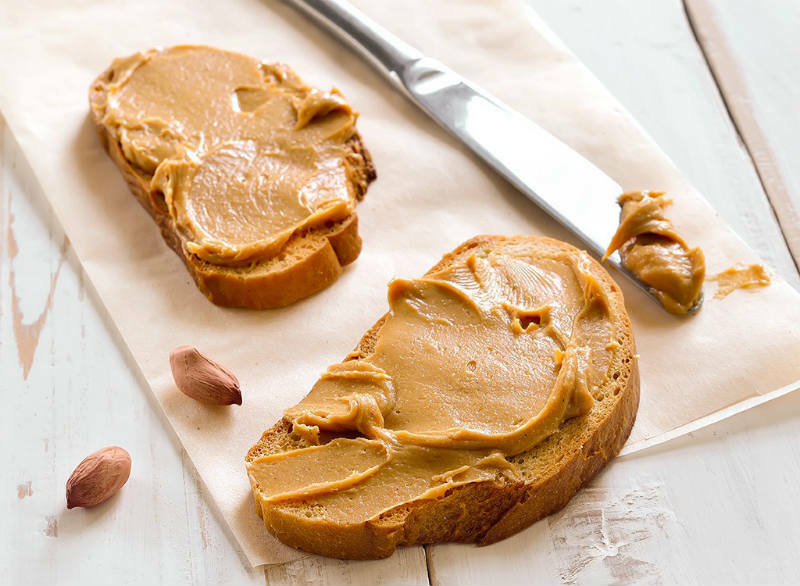 It is a big mistake – here are six peanut butter health benefits and reasons why it may be just the food you need to incorporate into your diet. Peanut butter is a unique product. Contains at least 50% fat and 50% are split between protein, carbohydrates and water. This makes it a far better alternative to other butter spreads (butter, margarine, cream cheese, etc.). The fat content in the butter is truly unique: about 17% of saturated fatty acids, 30 to 32% polyunsaturated fatty acids and 44 to 46% monounsaturated fatty acids. The composition of the fat is from palmitic, oleic, linoleic and 2-3% of the rare arachidonic acid. Peanut butter took the third place of the foods with the highest content of resveratrol right after red grapes and young red wine. Nutritional value per 100 g: 588 kcal, 50.3 g fat, 25 g protein, 19.6 g carbohydrates, 6 g fibers. Boosts Energy – Peanut butter contains good amounts of healthy fats and protein. This means it contains plenty of calories that will give you lots of energy for your activities. Perfect for a morning meal as it gives you an energy hit for the day. Lowers Cholesterol – The amount of fats contained in peanut butter is almost equal to that of the fats found in olive oil. Peanut butter contains both polyunsaturated fats and monounsaturated fats. As these fats are not saturated, they are good to consume without putting the heart at any risk. The unsaturated fats in peanut butter help to lower bad cholesterol levels (low density lipoprotein) and promote the circulation of good cholesterol (high density lipoprotein). Reduces Risk of Gallstones – Gallstones is one of the major health risks in developed countries which is caused by being overweight, crash diets, certain types of cholesterol drugs, and birth control pills. A study on peanuts and nut consumption relating to the risk of gallstones was undertaken and the results of the study showed that over a period of 2 decades, women who consumed peanut butter and nuts on a regular basis had reduced their risk of developing gallstones. Prevents Type II Diabetes – Consuming peanut butter can also be beneficial in reducing the risk of type II diabetes. Peanuts contain not only protein, but also unsaturated fats. Unsaturated fats have been noted to improve insulin sensitivity. Research into peanut butter consumption and diabetes showed that a higher intake of peanut butter and other nuts lowers the risk of type II diabetes. Prevents Cancer – Peanut butter contains B-sitosterol, a phytosterol that has a great property of fighting against cancer, particularly colon, prostate, and breast cancers. Peanuts and its products, such as peanut oil and peanut butter are ideal sources of phytosterols. Fights Depression – Low Serotonin levels leads to depression. Tryptophan in peanuts increases the release of this chemical and thus helps you fight depression. Due to the high content of unsaturated fatty acids and resveratrol it lowers the “bad” and increases the “good” cholesterol. Reduces the risk of cardiovascular diseases. Regular consumption of peanut butter reduces the risk of heart attack or stroke almost in half. Strengthens the immune system and protects against number of viral and inflammatory diseases. Slows the aging process in the body. Caution – It should be avoided by people with allergies to peanuts and legumes. Peanut butter may lead to aflatoxin poisoning. So be careful when you choose to consume peanut butter.